SpongeBob SquarePants has been on the air since 1999. In that time the show has produced hundreds of episodes, some wackier than others. Recently, the plot for an upcoming Season 10 SpongeBob SquarePants episode was revealed that sounds pretty insane. 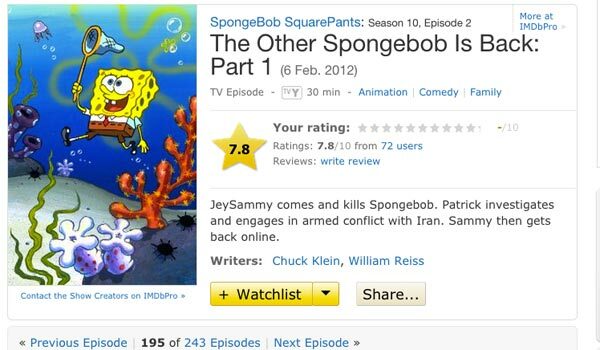 The plot features SpongeBob getting killed and Patrick getting involved in armed conflict with Iran. The episode would be sure to give children nightmares, but there is good news. It’s a big mistake. Message boards first noted the ridiculous episode description, but we know now that it is definitely a fake. The Huffington Post confirmed with Nickelodeon that the real Season 10 plot descriptions have yet to be revealed, and are not the ones currently on the IMDB page. If you look closely, you can even spot that it is a fake thanks to the airdate noting February 6, 2012. Season 10 hasn’t even hit the schedule, yet. It’s both simultaneously amusing that someone went out of the way to post fake SpongeBob SquarePants episode descriptions and equally disheartening that IMDB hasn’t fixed the descriptions, yet. It’s a good thing though that SpongeBob SquarePants doesn’t have plans to kill off its lead character or take a side in warfare. Something tells me the school-aged children who really dig the show might not be ready for a “you killed Kenny” type of plotline. Sure, we’ve seen SpongeBob dry out on the beach before. He’s been kidnapped, incinerated and gotten into other near death shenanigans. In addition, Squidward doesn’t always act kindly and there are other antagonists throughout the show. For these reasons, SpongeBob Squarepants is not every parent’s favorite series. However, if the show were to kill off its lead and then battle Iran, I’m guessing Nickelodeon would have quite a few more complaints on its hands. The new season of SpongeBob SquarePants was recently pushed back thanks to The SpongeBob Movie: Sponge Out Of Water; however, new episodes are expected to premiere sometime later this year.